Neodymium is a chemical element wi the seembol Nd an atomic nummer 60. It is a saft sillery metal that tarnishes in air. Neodymium wis discovered in 1885 bi the Austrian chemist Carl Auer von Welsbach. It is present in signeeficant quantities in the ore minerals monazite an bastnäsite. Neodymium is nae foond naiturally in metallic furm or unmixed wi ither lanthanides, an it is uisually refined for general uise. 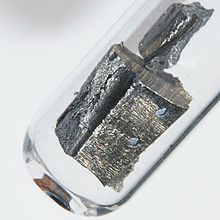 Altho neodymium is classed as a "rare yird", it is a fairly common element, na rarer nor cobalt, nickel, an copper, an is widely distributit in the Yird's crust. Maist o the warld's neodymium is mined in Cheenae.